The main difference between kale and spinach is that kale is rich in vitamin C and vitamin K whereas spinach is rich in iron. Kale and Spinach are two types of plants whose leaves are edible and extremely nutritious. Kale belongs to the cabbage family while spinach belongs to the family Amaranthaceae. Moreover, kale is a biennial plant while spinach is an annual plant. Kale is a type of leafy greens that belong to the Brassica family. This family includes cruciferous vegetables like cabbage, broccoli, collards, and, Brussels sprouts. Most importantly, kale is rich in vitamin K. In addition, it also contains vitamin A, C, B6, E, folate, thiamin, riboflavin, and pantothenic acid. Kale contains a considerable amount of iron, manganese, calcium, potassium, and phosphorus. 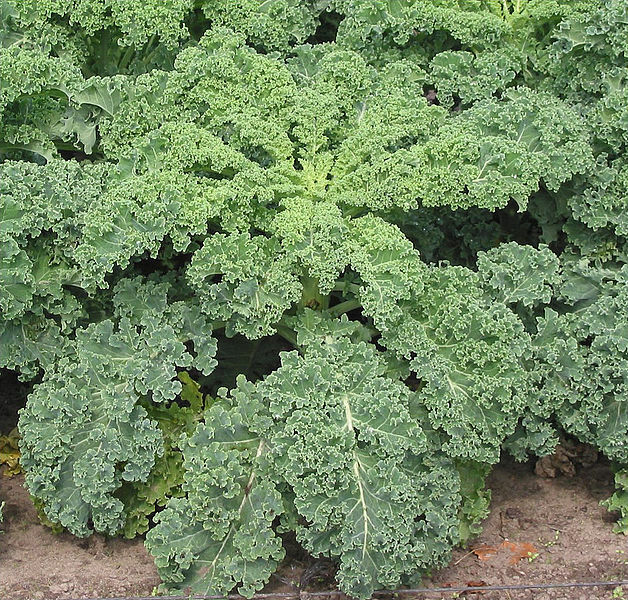 The main characteristic feature of kale leaves is that they are dark green in color and curly. Kale has high concentrations of anti-inflammatory, antioxidant, and anti-cancer substances. The two main antioxidants present in kale are carotenoids and flavonoids. Here, the main types of carotenoids are beta-carotene and lutein. For instance, over 45 types of flavonoids occur in kale. On the other hand, kale can work against several cancers like breast, bladder, ovary, and prostate cancers. Spinach is another type of leafy green rich in nutrients. It belongs to the family Amaranthaceae. 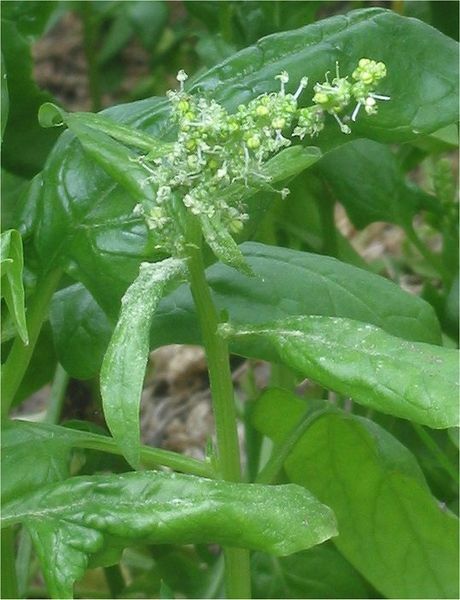 Spinach is native to central and Western Asia. Its leaves are edible as a vegetable either fresh, canned, frozen, chopped or dehydrated. Most significantly, spinach is rich in irons. It is also rich in vitamin A, C, K, E, B, B6, riboflavin, folate, magnesium, manganese, potassium, and calcium. Furthermore, the antioxidants present in spinach are carotenoids. The major form of carotenoids in spinach is epoxyxanthophylls, which can prevent the formation of prostate cancers. In addition, epoxyxanthophylls decrease excessive inflammation. The other types of carotenoids in spinach are beta-carotene, lutein, and zeaxanthin. Spinach also contains some flavonoids. Another significant component in this vegetable is glycoglycerolipids, a type of fat-related molecules, which protect the lining of the digestive tract. Kale and spinach are two plants whose leaves are edible. Also, both of them have a high nutritional value and are rich in iron, vitamin A, C, and K.
Moreover, they contain anti-cancer agents. Kale refers to a hardy cabbage of a variety, which produces erect stems with large leaves and no compact head while spinach refers to an edible Asian plant of the goosefoot family, with large dark green leaves widely eaten as a vegetable. The primary difference between kale and spinach is that Kale belongs to the family Brassica while spinach belongs to the family Amaranthaceae. Moreover, kale is Brassica oleracea while spinach is Spinacia oleracea. 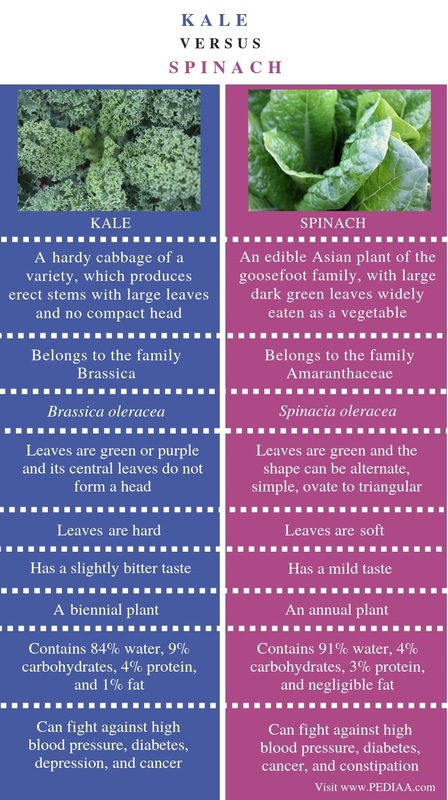 The shape and colour of the leaves contribute to another difference between kale and spinach. The leaves of kale are green or purple, and its central leaves do not form a head while the leaves of spinach are green and the shape can be alternate, simple, ovate to triangular. The texture of the leaves is another difference between kale and spinach. The leaves of kale are hard while the leaves of spinach are soft. Furthermore, kale has a slightly bitter taste while spinach has a mild taste. There is also a difference between kale and spinach based on their life cycle. Kale is a biennial plant while spinach is an annual plant. Raw kale contains 84% water, 9% carbohydrates, 4% protein, and 1% fat while raw spinach contains 91% water, 4% carbohydrates, 3% protein, and negligible fat. Besides, kale can fight against high blood pressure, diabetes, depression, and cancer while spinach can fight against high blood pressure, diabetes, cancer, and constipation. Kale is a leafy green rich in vitamin C and K. It is also rich in antioxidants and is capable of preventing cancers. On the other hand, spinach is another type of leafy green rich in iron. It is good for constipation. The main difference between kale and spinach is their slightly different nutritional value.